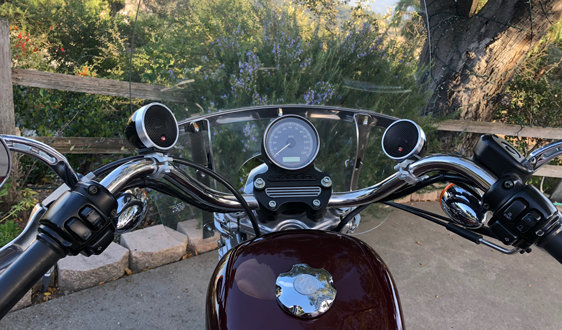 motorcycle audiophile riders can enjoy a true seamless sound stage directly in front of them, up at the windshield above the handle bar. A stereo image and a soundstage on their bike that is just as deep, wide, and up above right in front of them above the handle bar. As stable as they are accustomed to at a live concert or from serious high-endhome audio speakers. Seamless sound stage directly in front of you, up above at the windshield area. The impact of span AF-2 PodMc accent fill system is immediately obvious – the voices and instruments seem to magically take shape in a seamless sound stage directly ahead above the handle bar. The result is to create a listening experience that is much more like the experience of attending the live event – the musicians and sound sources seem to be arrayed in front of you as if you were sitting at the live concert first row. You will experience a more overall detailed sound and staging above the handle bar, more open and clear vocals, snappier and tighter mid-bass response and more. 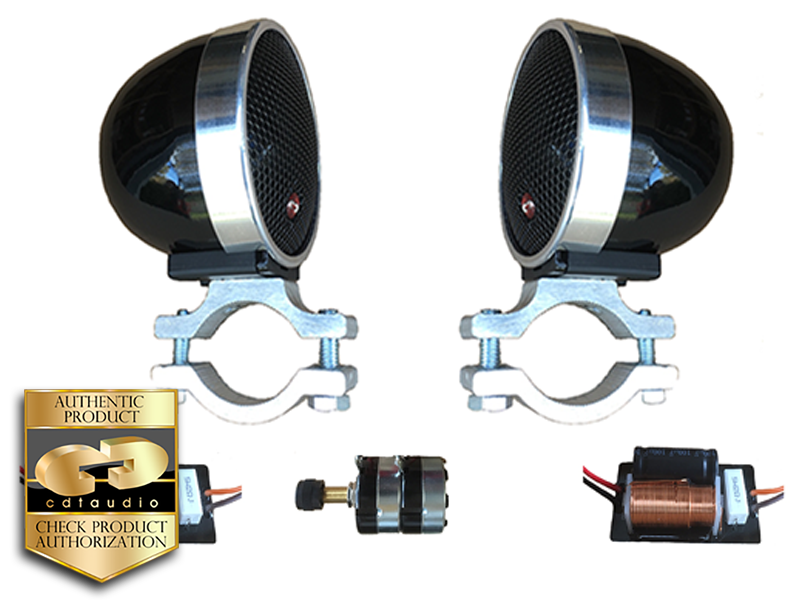 The AF-2PodMc system consist of a pair 2” Hybrid wide range mid- tweeters with range from 250Hz-20,000Hz. You wire the AF-2PodMc directly to your left and right front speaker channels. The system ships with crossovers and volume control so you can gradually raise the sound stage and make a perfect blend with your existing sound system. 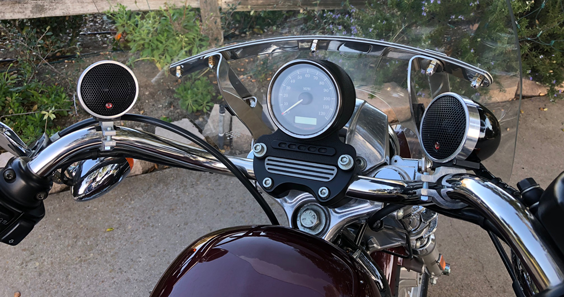 With the Accent principle CDT Audio introduces a new audio vista in motorcycle sound systems. This approach adds highlighting to the sonic environment. Variations induced by speaker installation location limitations are now reduced at the same time as the need for expensive complex amplification is reduced to an absolute minimum. Enjoy the best sound with ease. These systems average out acoustic discontinuities in the motorcycle environment. The CDT Audio accent fill system solution is to make the performance as near optimal as possible to the listener and with all musical material. This is visually analogous to having some light everywhere without glare or shadows. 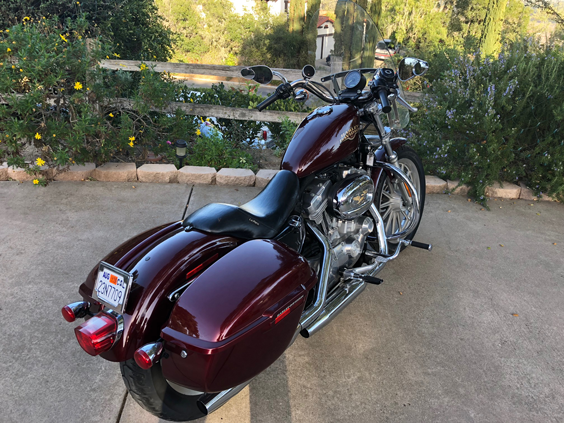 Smooth out and add sound details to the sound in your motorcycle sound system today by adding a MC-Accent Fill System. Additional speakers may be applied by a Pod on the handle bar or flush mounted in the fairing locations with an attenuating filter for adjustability to provide an attractive accent to the sound analogous to accent lighting in a display. Adjust every level any way you desire effortlessly. No additional amplifiers or crossovers are required. Everything is supplied in the kit. Nothing existing needs to be removed – all components are additional. However, if upgrading to CDT Audio components feel free to replace any existing components. One good amplifier with 2ohm-4ohm capability will handle the accent systems as well as the main system. The subwoofer is virtually always separately amplified to set up the major sensitivity differences involved at the high power levels associated with bass. This system ultimately lead to maximum fulfillment for all listeners virtually bathed in optimized sound. The openness, ease and fullness are a revelation. As in any fine instrument you will want to employ precision calibration after the installation. Each step is beneficial by itself and acts synergistically with the AF-2PodMc system to yield a natural ease that may be unique.